1-st day : Arrival in Sofia. Transfer from the airport to the hotel in Sofia (*). Chek –In. Walking tour Flavors of Sofia tour. It is a guided experience ranging from exquisite Bulgarian cheese and wine to heavenly rose flavor chocolate and the typic bantsa and boza. The tour combine flavors and history. You will meet the millenary history of this city. 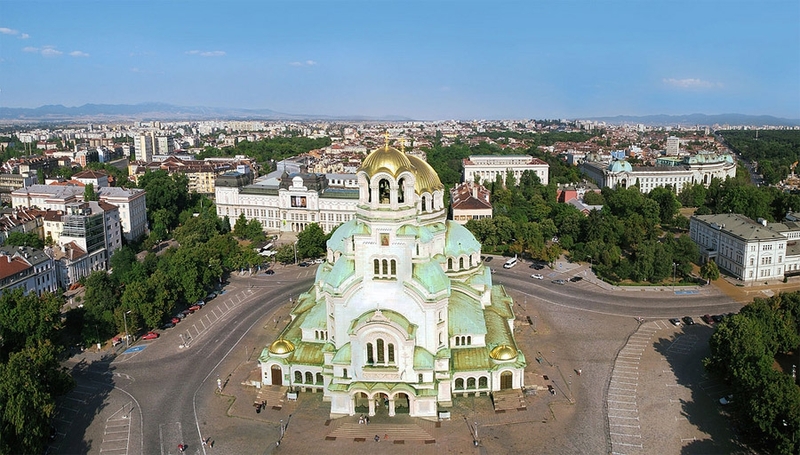 The main points are: the historic Alexander Nevski Cathedral, the cathedral is a flagship church of the Bulgarian Patriarchate, St Sofia Basilique (founded during the reign of Justinian reign 527-565),, Russian Church St. Nikolai the Miracle-Maker, the yellow cobbled area - symbol of the capital since the beginning of the 20th century, the “Ivan Vazov” National Theatre, The Rotund St George (built in the 6th century), the massive fortified walls built 2td – 3th, the covered market, the Museum of Sofia and the central market.We’ll introduce you to a representative sampling of food in the charming old quarter with the tastings included. Dinner in a traditional restaurant with national Bulgarian food. Overnight. 2-nd day: Breakfast. Departure to Panagurishte. Dinner with fine local wines. Overnight. 3-th day : Breakfast with homemade jam, honey, yogurt , local cheese and bread. Dinner in the yard with typical Bulgarian barbecue and Bulgarian beer.Overnight. Breakfast with katmas ,homemade liutenitza (delicious puree of tomatoes and red peppers) , local cheese , homemade jam, honey, yogurt. Trip to the museum town Koprivshtitsa ( about 40 min trip ). Koprivshtitsa is a captivating mountain town, unique with its cobblestone alleys, houses painted in bright colors with expansive verandahs and picturesque eaves.Visit of the town and the beautiful houses . Lunch in a typical restaurant in Koprivshtitza. In the afternoon back to Panagurishte. Visit of the wine celler Rumelya and degustation of the wines of many prices from France , Germany and England. Cooking class . 5-th day: Cooking lesson preparation of banitsa. Banitza prepared by layering a mixture of whisked eggs and pieces of cheese between filo pastry and then baking it in an oven. Breakfast with banitza and yoghurt . Chek-out . Departure to Starosel . ( trip about 40 min ) . One of Bulgaria’s top Ancient Thrace sites, the Starosel Tomb, has been dated to the 4th century BC after years of research. A peculiar temple-tomb was found there in an enormous mound, possibly intended for King Sitalkes. The archaeologists believe that the region was the power center of Ancient Thrace in the 4th century BC. It was destroyed during the rise of the Macedonian state of Philip II in 342-341 BC. Visit of the wine cellar Starosel. The Thracians were famous in the ancient world for its wines, which were declared as the best. Lunch with degustation of the wines. Departure to Plovdiv. ( trip about 1 hour ) Chek-in in a hotel situated in the heart of the ancient Plovdiv, a few minutes walk from the commercial center of the town in Renaissance houses built by wealthy local merchants about 200 years ago. Visit of the town Plovdiv is the second large town in Bulgaria. There are artifacts of Thracian civilization. The period during which Plovdiv has been within the Roman Empire was marked by the construction of many large public buildings like an amphitheater (late first and early second century of our era). And nowadays it is used for performances and outdoor concerts. Other major monuments of Roman civilization are the Roman Forum (2nd century BC) and Roman stadium in length of 180 meters and with 30,000 seats (second century of our era). At that time the name of the city was Trimontium, which means "town on three hills. "Bulgarian history is presented in the old town of Plovdiv with the big beautiful houses of 18 -19 century. They are evidence of the economic power of the city during this era. At that time Plovdiv compete with Thessaloniki and Istanbul. The walk along the narrow cobbled streets between high walls and overhanging second floors take us back in time. In many of these houses are now occupied exhibition halls, shops and restaurants. Dinner and overnight in the old town. Leisure time in Plovdiv for shopping. By noon departure to Brestovitza ( trip about 30 min ). Chek-in in a wine cellar with a 4*SPA hotel.Lunch.One wine SPA procedure 60 min + use of the the Romanian bath , the Bio sauna and the Tepidarium ( included in the price ). Visit of the wine cellar . Dinner with wine degustation. Overnight. 7-th day: Breakfast. Chek-out and departure to the airport of Sofia (about 1 h 40 min ).